In college, Bledsoe set single-season school records for passing yards (3946) and completions (241) and had a 476-yard passing performance. He was named Pac-10 Offensive Player of the Year following the 1992 season. Bledsoe entered the NFL draft following his junior year and was picked first overall by the Patriots. Bledsoe moved directly into the starting lineup as a rookie and passed for 2494 yards and 15 touchdowns as well as 15 interceptions, although he missed four games due to a sprained knee. A classic dropback passer with little mobility, he displayed poise and intelligence as well as a quick release and strong arm. Patriots went 10-6 to finish second in the AFC East, qualifying for a Wild Card berth in the postseason while leading the NFL in passing yards (4444). Lost AFC Wild Card playoff to Cleveland Browns (20-14). Bledsoe again led the NFL in pass attempts in 1995 with 636, but averaged only 5.5 yards per attempt and again had a negative TD-to-interception ratio (13 to 16). He came back in ’96 to throw for 4086 yards and 27 touchdowns, against 15 interceptions, and topped the league once more in pass attempts (623) as well as completions (373) as the Patriots won the AFC title. Bledsoe was chosen to the Pro Bowl, and again in 1997 when he achieved career highs for TD passes (28) and passer rating (87.7). There was a drop-off over the next three years, however, as Bledsoe’s performance declined along with the team and he took many sacks. 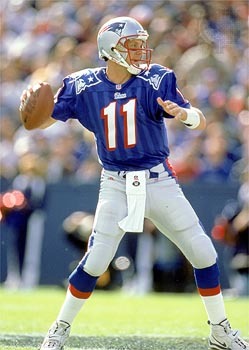 Still, he was given a huge contract extension, but two games into the 2001 season, an injury caused him to lose his starting job to unheralded Tom Brady, and while Bledsoe rallied the Patriots to a win in the AFC Championship game, it was the younger quarterback who assured his starting spot with an upset victory in the Super Bowl. Bledsoe was dealt to the Buffalo Bills in 2002 and had a Pro Bowl year, passing for 4359 yards and 24 TDs while compiling a career-best 61.5 completion percentage for the 8-8 team. He played two more years in Buffalo with lesser results and moved on to Dallas for the last two seasons of his 14-year career in 2005 and ’06, yielding the starting job to Tony Romo. Overall, Bledsoe was named to the Pro Bowl four times and passed for a total of 44,611 yards and 251 touchdowns, against 206 interceptions. While not quite achieving the anticipated level of success, Bledsoe remained a classy team player throughout his career.